Room & bard: The Midway inn offers delectable dining and literary leanings. 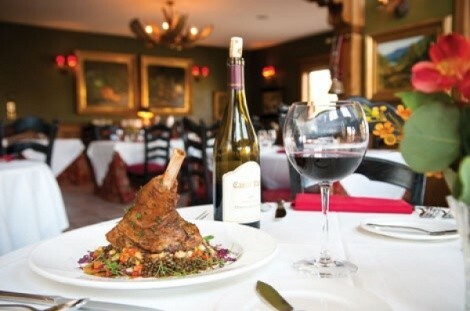 Midway’s Blue Boar Inn & Restaurant has a timeless quality. True, the modern cuisine and up-to-date amenities are New Millennium, but the charm, décor and overall vibe of the Blue Boar could come from the 20th, 19th or even 18th centuries. The European-style chateau is festooned with antiques and artwork—including an impressive collection of crossbows used in medieval battles—and has literary-themed rooms. There are rooms and suites named for Jane Austen, Elizabeth Barrett Browning, William Butler Yeats, Charles Dickens, Lewis Carroll and many more. During a recent stay, I found myself in the beautiful William Shakespeare suite—a room fit for King Lear himself. I find it fascinating that such Old World charm should come about as the byproduct of very New Age science. You see, the owner of the Blue Boar Inn & Restaurant is John E. Warnock, a computer scientist best known as the co-founder of Adobe Systems. Having Adobe dough behind the Blue Boar probably helps keep it afloat during the off seasons and in hard times; its neighboring Inn on the Creek was recently shuttered. Then again, the quaint restaurant and inn ought to be a success under any circumstances: The food, service, ambiance and hospitality are exceedingly rare in this Facebook and Twitter culture. The Blue Boar experience usually begins and ends with greetings and goodbyes from affable innkeeper Jay Niederhauser and his wife, Sandy. In between “hello” and “goodbye,” you’re in for a real treat. Because he resides in Wasatch County and works in Midway, chef Eric May probably doesn’t get the acclaim of some his colleagues closer to the Wasatch Front. But, he is quietly and confidently cooking up a tempest at the Blue Boar restaurant. From breakfasts of grilled Norwegian salmon, homemade granola, Irish steel-cut oatmeal and cinnamon-swirl brioche French toast to casual lunches and elegant dinners with Champagne and candlelight, May’s cooking and creativity continue to impress me. Dining in his restaurant is a total pleasure. It’s wise to book a room at the Inn, because dinner can get decadent. If you’re in a hurry, the service staff will certainly accommodate. However, the restaurant is geared toward leisurely, lengthy, savor-every-morsel dining—again, old school. So, sip a glass of bubbly as you tuck into a bite-size bit of crispy, cardamom-scented pork belly, which sits atop rhubarb compote and a paper-thin circle (looks like a doily) of watermelon radish. It’s a colorful, eye-popping dish that tastes like the work of art it is. From there, we move on to a plate of red, yellow and green heirloom tomatoes with Feta cheese mousse and green-olive “dust.” Note, however, that this dish was enjoyed during the last throes of tomato season, so you’ll probably have to wait until summer for an encore on May’s menu. A more wintery option is fondue for two, with Gruyere and Emmental cheeses, apples, cornichons, pearl onions and sourdough bread. Bridging warm and cold weather is another wonderful appetizer—a single diver scallop seared to a crisp crust, with diced, roasted red and yellow beets, frisée and a grapefruit reduction. This is a light dish—perfect for a starter—but with depth of flavor, thanks to the roasted beets. I applaud any Utah chef with the balls to put sweetbreads on a menu. Offal is a hard sell here. But anyone who tasted May’s delicate, tender, divine lamb sweetbreads with simple caper and sage brown butter sauce would be sold on sweetbreads. I don’t normally plead, but I think I remember begging May to keep these babies on his menu. The same goes for his salmon—it’s a keeper. In truth, I often find salmon boring. But in May’s hands, this mostly mundane fish sings, even though the preparation is relatively straightforward. It’s a thick grilled salmon medallion, lightly glazed with wildflower honey, poised on top of wilted pea sprouts and garnished with rounds of fried plantains. Most human beings would have thrown in the towel after those samplings. But, I don’t get out to Midway much and I wasn’t going to retire to the Bard’s suite without eating boar at the Blue Boar. So, I let my belt out a couple notches and dove into Dijon-crusted wild-boar chops, served with a rustic mélange of braised red cabbage, green apples and candied walnuts in a red currant sauce. Now there’s a hearty winter’s dish to warm the soul after a day of skiing the Olympic cross-country trails at neighboring Soldier Hollow. Superb service from Brittany, Joyce and Michael, in particular, add to the seamless quality of dining at the Blue Boar. Visits from Niederhauser aren’t intrusive, but rather very warm and welcomed. The stories he has to tell will beguile you. But, not quite finished, we still have a hearty cassoulet to enjoy—with homemade duck confit, Great Northern beans, smoked sausage, house-made pancetta and herbed bread crumbs, the latter of which form a wonderfully crunchy crust. And then, before you know it, hours have passed and it’s time for dessert. Thankfully, there’s a wonderful vanilla-bean creme brulee on the menu, garnished with fresh berries and powdered sugar. And, while we’re at it, why not also enjoy May’s affogato (“drowned” in Italian): scoops of vanilla ice cream topped with espresso, sprinkled with chocolate-covered espresso beans and served with a chocolate-dipped gaufrette fan. Wow.